Yesterday was a perfect Varzuga fishing day, mixed sun and cloud, a light breeze with an air temperature of 10⁰C – 15⁰C and the water temperature steady at 13⁰C. The heavy rain showers of Wednesday pushed the river level up ½”, but other than that it was a really settled day. Our guests at Middle were off early with Ian and Doug taking the left bank of Yovas Rapids and Peter and Olivier the right bank which is a slightly longer walk but easier. Despite my saying that there were miles and miles of fishing up there and there was no need to go all the way to Scott’s of course they could not resist it and they started right at the top. Pasha’s and Dunkery were reported to be ‘heaving’ with salmon, and good sized ones as well. The four rods in Yovas accounted for 38 of the 60 salmon we landed at Middle Camp yesterday. 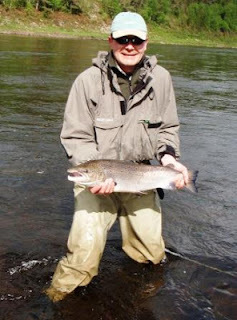 Ian was back to the top of the board again with 14 fish closely followed by Doug (his mojo returned) with 11 – several fish of over 10lbs were landed and all talked of them fighting really hard in the cooler water temperature. A major success was the first salmon for Myriam I – she had never caught a fish before and while we were all out she waded Generator by herself, hooked, landed, photographed and released a lovely hen fish of about 8lbs and strolled back into camp with a huge smile and those slightly shaky hands we all get after a huge adventure. A great feat and one she has shrugged off with remarkable modesty. Pana reported 20 salmon with the float trip not having great success and the salmon mainly concentrated in the Lunch Pool area. 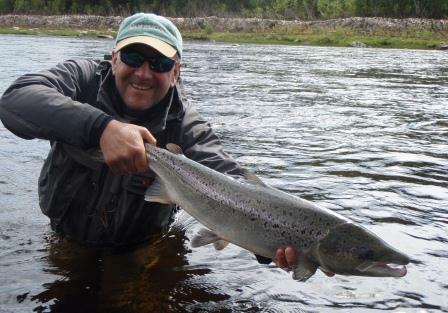 Kitza had another good day with 44 salmon to their team of eight rods. Charles had a super day taking 10 fish from Kitchen including one of 12lb and one of 18lb. 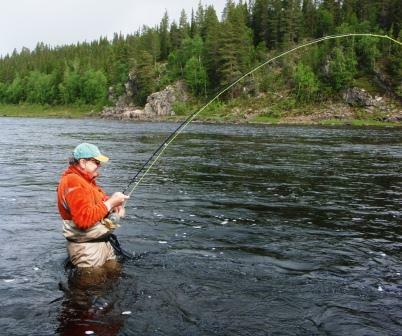 In the evening Tom radioed in to say that a big run of fresh fish had come splashing through the pools around camp. The water at Kitza is low enough to prevent any boating other than a ferry downstream as far as Piddling Pool. However at Kitza, like at Middle, once the guests have settled into the low water beat regime they all adjust to it quickly, the fishing can be great and the pools so much better defined. The week has flown by, it is the last fishing day and everyone is out making the most of this extraordinary river. I await the helicopter due shortly in camp with next week’s food and drinks and tomorrow we leave for Murmansk. I will endeavour to give you a brief update before we leave, but if I fail then normal blog service will resume on Sunday morning.